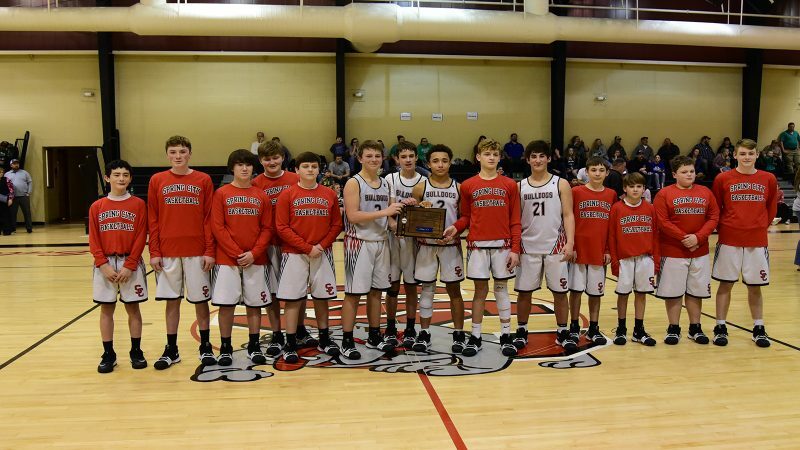 Spring City, TN — Spring City Middle School Bulldogs won 55-44 over the Midway Greenwave to earn a bye in the State Tournament next week in Gatlinburg, Tennessee. The game was a bit of revenge for Spring City, who lost last year to Midway in the Championship game. Spring City used a balanced attack as three players. Austin Brackett and Jaden Pankey scored 16 points each and Cade Cook scored 15 points to lead the scoring for Bulldogs. Drew Fisher had 5 points and Landry Jolley had 3 points to finish out the scoring. Dalton Bacon had 20 points to lead all scorers on the night. Unlike the previous game, the Bulldogs came out on fire in the first quarter. Austin Bracket(3) and Cade Cook(2) combined for five first quarter three point baskets in contrast to only two three point baskets in entire Rockwood game the night before in a win that put Bulldogs into the championship game. Midway did not wilt though as Dalton Bacon led the Green Wave with 8 points and they stayed close at 18-14 deficit at end of the first quarter. Midway kept their game close to basket for their 14 points. In the second quarter, the pace slowed some and Pankey and Cook accounted for all nine Bulldogs points versus eight for Midway to keep Spring City on top 27-22. Spring City owned the early part of third quarter and a Jaden Pankey shot put Bulldogs up 34-24 with 2:14 to go in quarter. Midway was not going down without a fight and outscored the Bulldogs 12-2 over the last 2:14, with a Dalton Bacon three pointer at the buzzer bringing Midway to even. Emmett Hegland had eight points to lead all scorers in the third. From a tight 42-41 lead, it was Austin Brackett and Jaden Paney with seven points to push the lead to 49-41 lead but Bacon three gave Midway hope at 49-44 with 1:24 left in game. From there on, the Green Wave could not buy a basket and they were forced to foul and Bulldogs made enough free throws to finish out the game with 55-44 win. Final score did not reflect how close this competition was.